I read too much self-help books growing up (I read self-help books of Canfield & Carnegie since high school—maybe that explains why I grow up like this!). And it was from those books that I absorbed the ideas of vision board and the power of thoughts. I created my first vision board in my first year in college. I did it on an A4 page that I inserted into a clear envelope inside my ring binder. It was pretty straightforward and there was nothing aesthetic about it: basically, I just cut out some pictures from old magazines—pictures that represent the things I want in life. At the time, these are pictures of handsome guys, lovey-dovey romantic scenes, and branded goods (plenty of them in the magazine’s ads!). I scribbled some affirmations on top of it with a gel pen. Something along the lines of ‘You’re Beautiful’ or ‘Guys Like You!’. I guess you could see where my priority lies back then. After my college days, I kept on creating vision boards, at least once every 1-2 year(s). I no longer made it in my ring binder, though. Sometimes I made a spread of my vision board inside my journal. Other times I created my vision board as a desktop wallpaper so I can see it every time I open my laptop. And about 10 years ago I bought a writing board in a bookstore: half of it is a cork board and the other half is a whiteboard. I used it to create my vision board ever since. 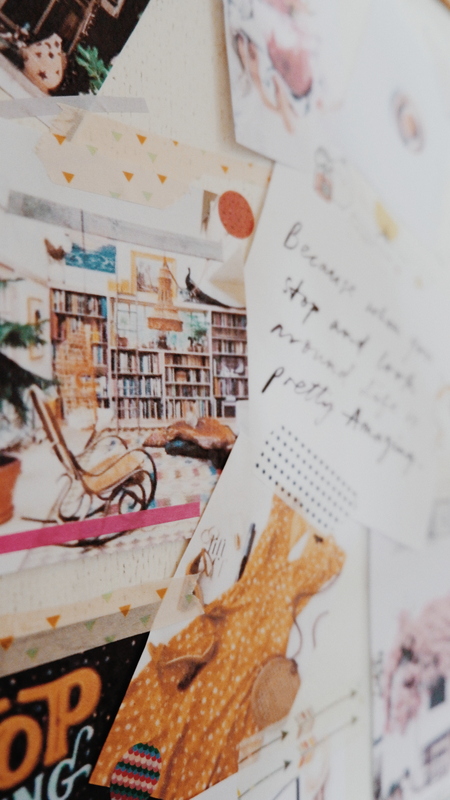 To me, apart from trying to figure out what kind of life I want for myself, making a vision board is simply a fun activity—especially when I am stuck at home with nothing better to do. It’s a bit like daydreaming (or hallucinating), but this time you could actually see what you’ve been daydreaming about right there, on the board (or paper, or whatever medium you choose). Collecting words, images, and pictures for your vision board. Because I have stopped hoarding magazines, these days I go to the Internet to find pictures and images for my vision board. My favorite go-to places are Unsplash, Storyblocks, and Pinterest. However, when it comes to selecting words, pictures, or images, there is one thing I learned from my previous mistakes in creating vision board(s). Previously, I was very literal when it comes to my vision boards. If I wanted to lose weight, I would find a picture of a girl with a fit and well-toned body. If I wanted to be in a relationship, I would find a picture of a happy couple. If I wanted a house, I tried to find a picture of a beautiful house. If I wanted more money? Exactly. I would find a picture of a huge pile of money. I did this for quite some time only to realize that I usually lost my interest in my vision board after 2-3 weeks (which means I would take down my vision board from the wall and hide it behind my cupboard). Somehow, seeing those things on my vision board weighed me down with the realization that I do not have them. Every time I looked at my vision board, I felt a bit stressed out, as if I was forced to work hard to make them a reality; or else I would end up a failure. 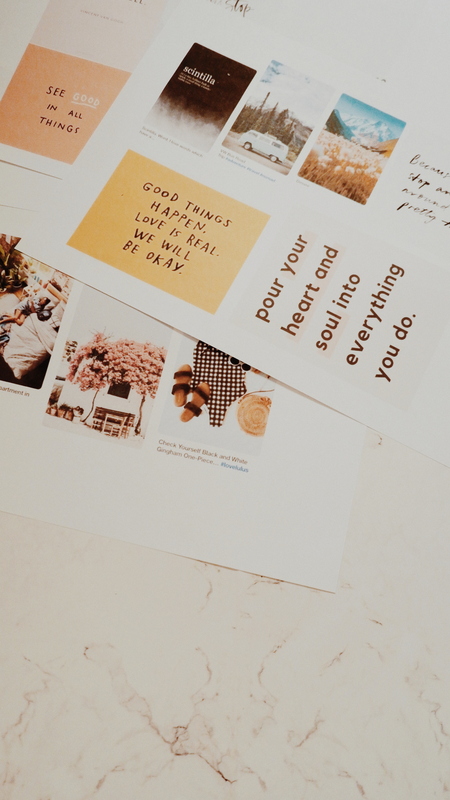 So, here’s how I created my vision board today: instead of focusing on finding the images of the things I want, I am focusing on finding pictures, quotes, or images that stir a happy and comfortable feeling inside of me. That’s it. No more images of a bunch of branded goods, a pile of money, or a first-class cabin–if seeing them don’t make me feel happy or comfortable. The same goes for finding a quote. If my heart melts when I read the quote, the quote ends up on my vision board. I realized that this is the approach that works best for me: to concentrate on feelings instead of things. I want to be able to look at my vision board and feel happy instead of stressed out from thinking about how I would get all those things I didn’t have. I want to look at my vision board and be reminded of the feeling I have always wanted to feel in life: happy, content, peaceful, creative, free, loving, safe. A vision board works best for me when it focuses on feelings instead of things. If you think you’re someone like me, you might want to try this approach for your vision board. However, if you think you’re more motivated, driven, and inspired when you know you’re chasing things instead of feelings, by all means, create your vision board that way! 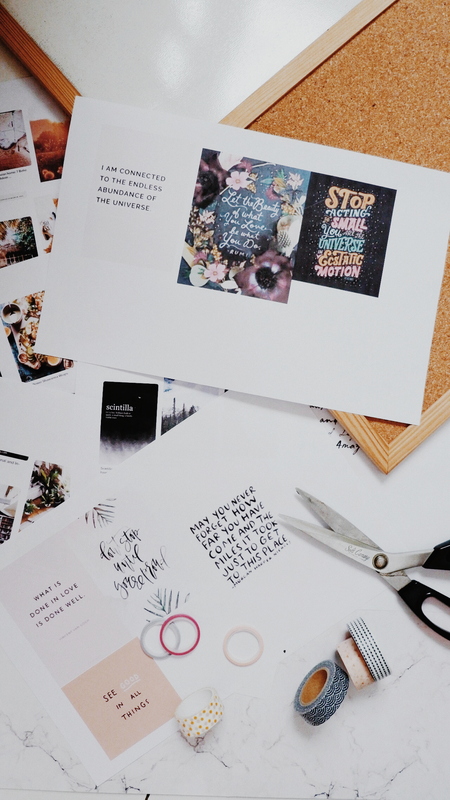 The bottom line is to create the vision board you’ll love, that will make you feel happy and inspired after seeing it instead of stressed out and demotivated. Find out which type of person you are, and create a vision board that will serve you best! After finding all the pictures, images, and words or quotes I want to use on my vision board, I usually print them all (I use usual photocopy paper) and then cut them out. Then, I will try to find the best layout for the cut-outs to be displayed on the board. I mostly use washi tapes and cardboard pins to do this (instead of glues or double-sided tape). I want to make sure that I can reuse the board again the following year. Once I’m done with my vision board, I display it in a spot where I can see it often, on a daily basis. If I find some particular pictures or quotes that annoy me somehow, I take them down or replace them with something else. I like to see my vision board as a living organism that grows with my state of mind and my state of being. So, I allow myself to change things here and there when I feel the urge to do so. 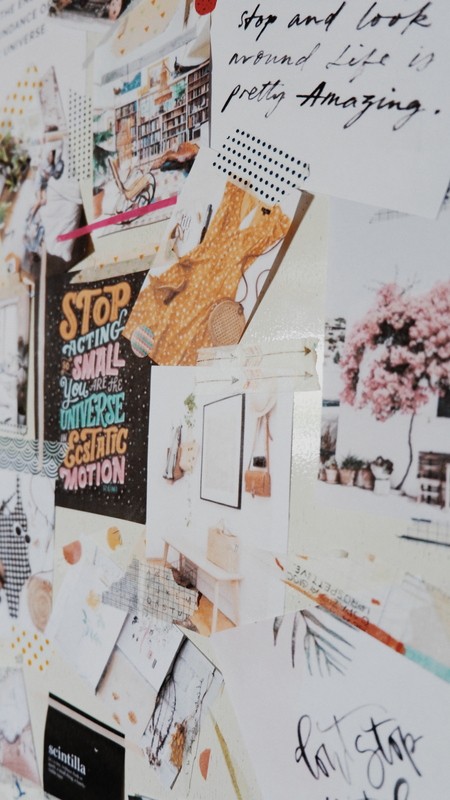 Plus, the idea of having this vision board is to lift up my mood! So, I want to make sure that I like what I see and can feel an instant boost of happiness just by looking at it. Keeping a vision journal as a company. Whenever I feel inspired (usually on a relaxing Sunday evening), I will pick an image or a quote from my vision board, look at it, and write down whatever goes through my mind about that particular image or quote. It helps me to access the feeling each picture or quote evoke in me and clarify what the image/words actually represents. Why does this particular image/quote feel good to me? What does this image/quote remind me of? What does this image/quote represent in my life? What can I do, daily, to recreate the feeling this image/quote evoke in me? What would my days look like if I have experienced everything that is represented by this image/quote? How would I be a different person if I have experienced everything that is represented by this image/quote? How would my outlook on life change if I have experienced everything that is represented by this image/quote? To me, answering those questions help to gain clarity on the kind of life I aspire to have and the kind of person I’d like to be. It feels easier because I don’t have to start writing from nothing: I have a picture I want to write about and some questions related to the picture! Now, all I need to do is answer those questions honestly. I actually find this journaling activity relaxing. It really helps me to bring something abstract into a more concrete pen-on-paper kind of thing. Whenever I reread the journal, I was reminded again of the feelings I want to invite into my life. It serves as a compass that keeps on pointing to the North whenever I feel like I’m disoriented or about to get lost. Creating a vision board together. 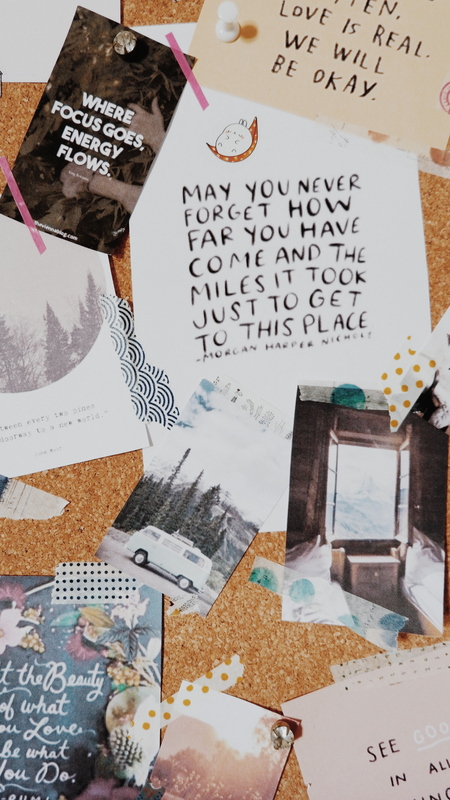 Creating a vision board doesn’t have to be a solitary activity. If you like, you can also work on a shared vision board with a group of friends, with your spouse, or even with your colleagues. When I was still working full-time, I created a ‘professional’ vision board together with everyone else from my division. The end result was our division’s vision board, representing everyone’s professional wishes and dreams. Once we completed the board, we took turns to point out the images or quotes we’ve pasted. Each person told everyone else what their images/quotes represent; both for the division and for his/her professional development. It was a really interesting exercise because it stirred a fun and relaxed conversations about things that are not usually talked about! Professionally, we’re usually talking about what we want (promotion, opportunities, flexible office hours, payrise) instead of why we want them. 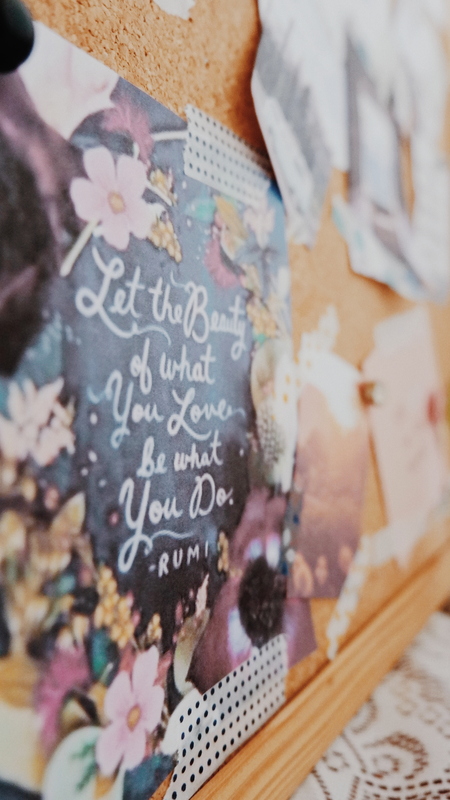 Discussing the images and quotes in the vision board by answering some of the journaling questions listed above can really help us to understand others better: to know what’s important for them and find out what really moves or motivates them in life. So, feel free to work on your vision board as a group or a pair! Anyway, I’ll be very happy to hear your stories about creating a vision board or keeping a vision journal. Let me know if you’ve tried this and what kind of vision board works best for you! I donated all my self help books years ago…but I do enjoy making collages still and do several a year to ‘check in’ visually with where my interests are. This is just a lovely post you have written and I hope many will give making a vision board a go to see what shows up. Thank you. I used to make vision board back in 2014. It was really fun that I spent 2 or 3 days to make that styrofoam board LOL But I did not update my vision board. It got dull and looked less attractive each day. Alternately, I keep journals to practice expressive writing and keep my focus. Anyway, I am also keeping loads of journals :’D Been trying bullet journaling and using only 1 notebook–love the idea, but I write way too much that 1 thick book only lasts for 1.5 months :’D So now I am back to my old system of having multiple journals for different purposes (business-related ideas, personal project/creative ideas, personal journal, planner + to-do, learning/reading notes/journal, travel journal, etc. ).